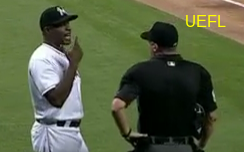 HP Umpire Cory Blaser ejected Marlins Hitting Coach Barry Bonds for arguing a strike three call in the bottom of the 6th inning of the Giants-Marlins game. With two out and two on, Marlins batter Chris Johnson took a 2-2 slider from Giants pitcher Will Smith for a called third strike. Replays indicate the pitch was located off the outer edge of home plate and belt high (px 1.311, pz 2.872), the call was incorrect. At the time of the ejection, the Giants were leading, 1-0. The Giants ultimately won the contest, 1-0. This is Cory Blaser (89)'s second ejection of the 2016 MLB regular season. Cory Blaser now has -3 points in the UEFL Standings (-1 Previous + 2 MLB - 4 Incorrect Call = -3). Crew Chief Jeff Nelson now has 4 points in Crew Division (4 Previous + 0 Incorrect Call = 4). This is the 129th ejection report of the 2016 regular season. This is Miami's 4th ejection of 2016, 3rd in the NL East (ATL 7; NYM 5; MIA 4; WAS 3; PHI 1). This is Barry Bonds' first ejection since August 4, 2006 (Ron Kulpa; QOC = U [Balls/Strikes]). This is Cory Blaser's first ejection since May 6, 2016 (AJ Pierzynski; QOC = N [Balls/Strikes]). Wrap: San Francisco Giants vs. Miami Marlins, 8/10/16 | Video available via "Read more"